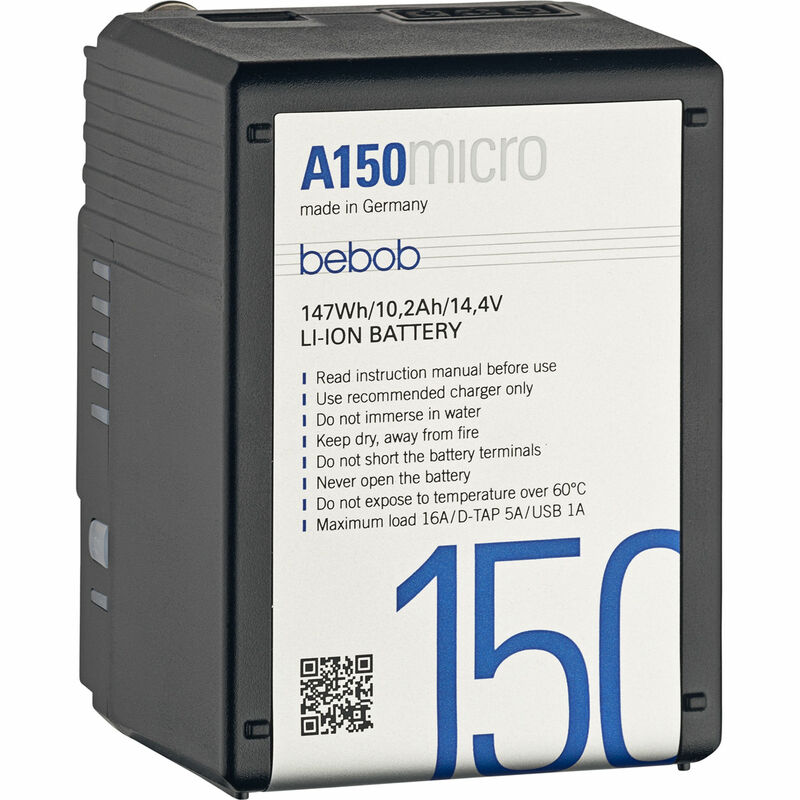 The compact A150 Micro 14.4V 147Wh Gold Mount Li-Ion Battery from Bebob is designed to be strong, reliable, and versatile and features a Gold mount. It's built to withstand falls from 4.9' but if it does get damaged, its mechanical components are replaceable thanks to Bebob's modular design. Also, when the battery capacity weakens after years of use, the batteries can be re-celled. To help decide when to re-cell, a status alarm is built into the battery. Another flexible feature is the 5A twist D-Tap port. Normally you're limited to connecting a D-Tap cable only one way, but the A150's twist D-Tap allows you to plug in your cable either way. The A150 also provides a 5V USB port for charging your mobile devices on location. The A150 features lithium-ion trimix cells that offer a 10A maximum draw and a capacity of 147Wh. The five-step LED status shows green when over 70%, yellow when the capacity drops below 70%, and red when below 50%. It's compatible with Bebob and Anton Bauer chargers. Charging time is approximately 3 hours when using Bebob AS2/AS4 chargers.